But in my opinion, this app makes batteries wasteful because we have to open it simultaneously with Pokemon Go. Features of this application is quite complete. We can set notifications for pokemon that we wanted. 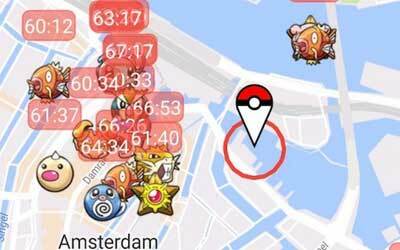 In addition, we can also set “show on map” to pokemon that we want. So, we will not see the monster that we do not want. The initial view of this application is our current location. But if we want to find the monsters in other areas we can “long tap” on the area that we want. The cursor will be moved to the area and the application will start the search. Additionally, disappear time feature is also available on this app. This application is also integrated with Google Maps, so we can use the “route” facility to find a route to the monster. We keep fight our battle against captchas. This update should drastically reduce the pops. This app has many features which are very useful for Pokemon trainers. I like the configuration menu which allows me to choose what monster that I want to search. So, I can focus to my favorite monsters. This app runs smoothly and works great on my Android. The server response is also great, just need a few seconds to get the result.